Pie Day Friday: Vive la France! 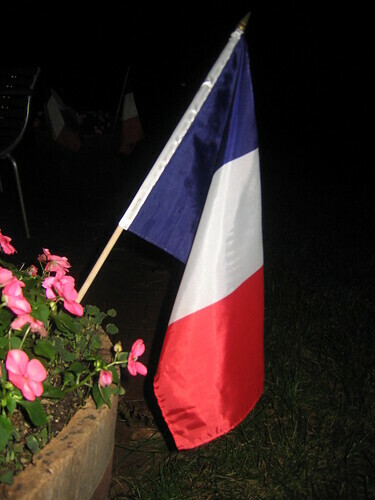 A while back, I spent a year living in France. Ostensibly I was there to absorb a bit of culture and to study the French language. Naturally, I ended up never once visiting the Louvre and to this day I remain unclear on the distinctions between the passé compose and l’imparfait. (Don’t even mention the passé simple.) My sojourn, however, did not go by without an education of sorts. I learned, for example, that there are few things better than riding on the back of a motorcycle along the Cote d’Azur with a handsome young Frenchman named Yann. I learned that when careening down those hills you can smell the fragrant fields of lavender before you catch sight of them and that the Mediterranean sea shimmers like a mirror sprinkled with blue. I learned that a year is not nearly enough time to spend in France when you’re 20 years old and poised for Life. I learned, finally, that it’s much easier to say Bonjour than Adieu. Ah, well, c’est la vie. My contact with Yann ended as soon as my plane lifted off from Charles de Gaulle. I’ve never returned to that part of France, in part because I fear that the lavender fields have been overrun by Americans seeking their own Year in Provence. Fortunately, though, I still have pissaladiere. For those of you non-Francophiles, here’s a pronunciation guide. Although this will sound a bit like potty-talk, you must understand that the proper way to say this is Pee-sa-lah-dee-yair, not Piss-sa-lah-dee-yair. Pee not piss. Got it? The name comes from pissalat, an anchovy and herb paste that’s commonly found around those climes. Alternately, you could call it a Nicoise onion tart. Nicoise, as in from Nice. 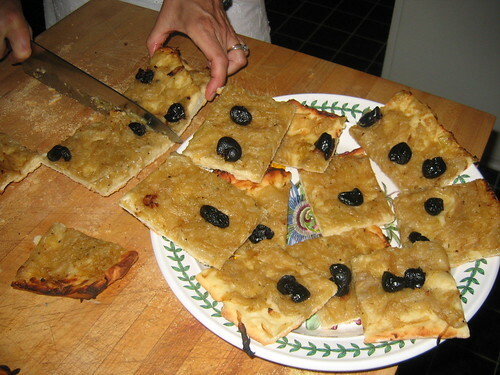 In France, fat squares of pissaladiere are sold in bakeries scattered throughout Mediterranean villages. I’d often stop on my way home and pick up a piece to munch on as I walked up the hill from town. Sometimes, I’d run into one of my good friends – Yann and his brother Patrick, or Karen, Magali, or Dominique – and then we’d gather at a café and gossip and drink a pastis together, too. Then, I’d resume the walk up the hill, although by this time I was probably hungry again and would need to stop at a patisserie for a pain au chocolat or a petite strawberry tart. . .
All of which helps to explain how I eventually returned to the U.S. with lots of good memories -- and a suitcase full of clothes that no longer fit. Originally this recipe called for the dough to be rolled out, transferred to a pizza peel, and then baked atop a hot pizza stone. I’ve discovered that it’s much simpler to simply press – or roll – the dough onto a baking sheet or pizza pan and then bake. However, the Queen gives you the choice. . .
Make the dough by dissolving yeast in 1 c. warm water. Let stand 5 minutes, then add oil. Mix together flour and salt in a medium-sized bowl; add yeast mixture and stir well. Turn out dough on floured surface and knead until dough is smooth and elastic (about 5 minutes.) Form dough into ball and place in a bowl that has been lightly coated with oil. Cover with a damp cloth, leave in a warm place, and allow to rise for 1 hour. Heat oil in large pan over medium-low heat. Add onions, bay leaf, and generous amounts of salt and pepper. Cover pan and let simmer 45 minutes, stirring occasionally. Uncover and continue cooking until moisture is nearly evaporated. Stir in thyme and garlic. 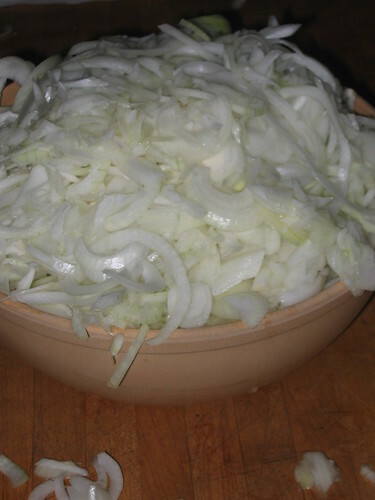 Continue cooking until moisture is completely evaporated and onions have cooked down to a thick mass. Remove bay leaf. Roll dough onto a floured surface and transfer to a baking sheet or pizza pan that has been lightly dusted with cornmeal. Cover dough with a damp cloth for 30 minutes. Preheat oven to 450. 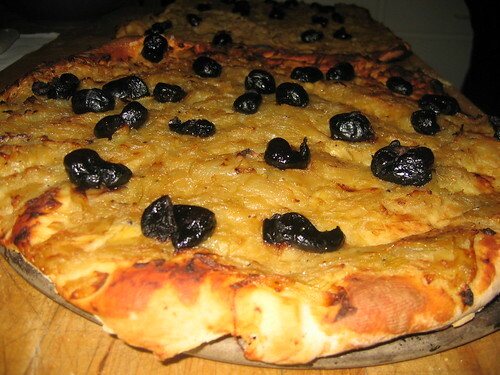 Remove cloth from dough and spread a thin layer of anchovy paste across the top of the dough. Spoon onions atop and arrange olives decoratively. Bake until crust is brown, approximately 20 minutes. Pissaladiere may be served warm or at room temperature. My name is not Yann, I am not young, nor French nor handsome. I have a motorcycle though. Will trade pie for rides. I will actually try this one when the weather cools down a bit. Looks fabulous! I have a motorcycle, too. You make the pissathingy, and I'll pick you up around 7:00, okay? But I never bake. I have a bit of a phobia about baking because you only have one shot to get everything right. Everything else I cook I can guess on proportions, then fine tune if necessary. So serious question: how do you go from being a good cook to a pretty good baker? Success! Well, sort of. I didn't actually *bake* a pie, nor did I make the crust. But I made the filling and topping for the French silk pie, and it was quite yummy! Because I took it to a party where the pie would be sitting out, unrefrigerated, for a long time, I used Egg Beaters instead of eggs to reduce the chance of food-borne illness. I find there's no quicker way to not be invited to future parties than sending guests to the hospital with food poisoning. cjquinn and Currydude, Ummm...gentlemen...I'm sure you both have very large and serviceable . . .motorcycles. Unfortunately, it's quite difficult to balance a pie while riding said vehicle, so for now the Queen will continue to rely on her carriage. Ok, then. We'll wait for it to cool down a bit and I'll pick one of your recipes. If I fail I will blame you and perhaps sue you for the various costs of therapy and anti-depressants. Make a pie I did! Right down to the chocolate shavings! Maybe next time, I'll even make the crust. I am but your humble student. You have brought much wisdom... Day of Dough, and such. I will try this recipe too. I am but your mere subject. Thank you for your words of wisdom and lessons in the ways of dough. This looks delicious... Will your majesty take on lemon meringue pie at some point? Anonymous, The Queen is delighted to entertain requests. Consider this your pie-making jukebox. 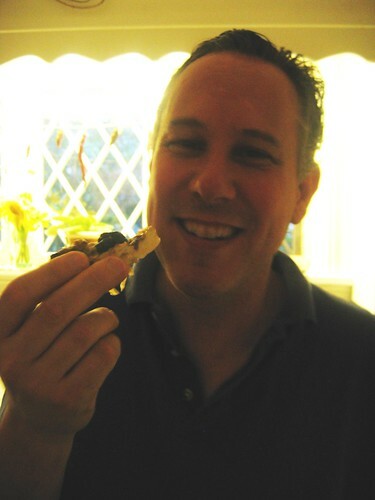 can't wait to relive it all again with the taste of the pissaladiere. Anonymous, Eh, bien sur, cherie. La vie est (encore) belle, n'est-ce pas?